They certainly had, and have, a lot to talk about after three years of the highest tensions since the end of the Cold War. Political contact all but ceased in 2014 after Russia’s annexation of Crimea and intervention in Ukraine set off major protests and economic sanctions imposed by the EU and the US that Norway has upheld. Russia and Norway, which otherwise have managed to remain relatively friendly over the years and cooperate on various issues especially in the far north, have also been quarrelling over military and immigration issues and, most recently, Russia’s denial of visas to two Members of Parliament. Russia’s embassy in Oslo has been on the offensive since the arrival of its new ambassador late last year, issuing long lists of complaints. 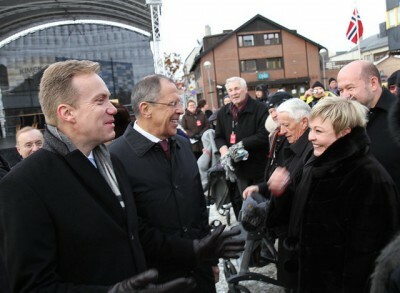 Lavrov and Brende, however, have continued to seem to get along on the few occasions they’ve met, including an important visit Lavrov made to Norway’s far northern city of Kirkenes in October 2014. That was to mark the 70th anniversary of the Soviet-aided liberation of Northern Norway from Nazi Germany, for which many Norwegians remain eternally grateful. Lavrov and Brende also spoke a few weeks ago at the G20 meeting in Bonn. This week’s visit is special, though, and being closely watched. Most agree it is a sign that both Russia and Norway still want to be good neighbours and friends, and keep cooperating in such areas as fishing rights, search and rescue operations and border issues in the north. That includes everything from the visa-free border crossings that are supposed to be enjoyed by both Norwegians and Russians living near their shared border just east of Kirkenes, along with an agreement on seismic activity that makes it possible for Norwegian and Russian vessels to cross the border in the Barents Sea. Brende thinks the conference itself, entitled “The Arctic – Territory of Dialogue,” is extremely important for Russia, with President Vladimir Putin making an appearance at it on Thursday. It has attracted around 800 foreign participants including the presidents of both Finland and Iceland and a deputy prime minister from China, according to The Independent Barents Observer (external link), which specializes in Arctic and Russian issues. The conference’s title is hardly a coincidence, noted NRK, after Russia has been subjected to international isolation and sanctions and remains under criticism for Putin’s repeated crackdowns on the opposition. Just days before Brende and other international guests traveled to Arkhangelsk, one of Putin’s arch-rivals was murdered on a street in Kiev and demonstrators protesting corruption in Russia were rounded up and arrested. That prompted the Norwegian secretary general of the Council of Europe, Thorbjørn Jagland, to protest as well, and demand that those in custody be immediately released, since their arrests were a violation of human rights and Russia’s own commitments through its council membership. The list of issues to discuss was thus long, with Brende mentioning both Ukraine and Syria Friday morning but declining to go into detail on what was actually said. Brende wasn’t the only one noting that the discussions were nonetheless important. “Just the fact that Brende traveled to Russia is very important,” Julie Wilhelmesen, a senior researcher at the Norwegian foreign policy institute NUPI told news bureau NTB. “This will be an opportunity to open up for a type of normal diplomatic communication that is very necessary.” Monica Mæland, Norway’s government minister for business and trade, is also due to travel to Moscow in April for meetings with her Russian counterparts. Rune Rafaelsen, the mayor of the Sør-Varanger region in Finnmark that borders on Russia, was also relieved Brende went to Arkhangelsk. He thinks it’s high time Norway resumes political contact with Russia at a high level. 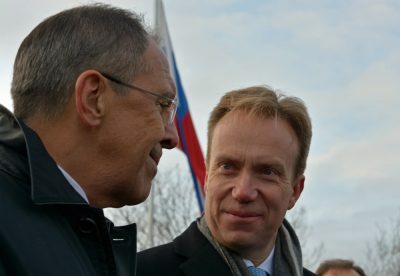 NRK reported that Brende was guided around exhibitions at the conference in Arkhangelsk by Dmitrij Rogozin, Russian deputy prime minister, who sparked conflict himself two years ago when he changed planes on Svalbard even though he was on the sanctions list of Russians deemed unwanted because of their support for Russian policies in Ukraine. Since then, Norwegian MPs Trine Skei Grande and Bård Vegar Solhjell were denied visas to Russia and Kirkenes-based journalist Thomas Nilsen, editor of The Independent Barents Observer, has been denied entry into Russia as well. Brende told NRK, however, that he’d received “signals” from Lavrov that there are “no great problems” in the relation between Russia and Norway. “That’s a good foundation for the conversations between me and Lavrov here in Arkhangelsk,” Brende said. To read more on Brende’s meetings and the Arctic conference in Russia, click here (external link to The Independent Barents Observer).